Rep. Mike Quigley speaks to EVA members at the Happy Village. Michael VanDam opened the July 10 meeting at 7pm at the Happy Village and introduced Business Minute: Healthy Soil Compost turns household compost into fine dirt. Firm provides bucket for organic waste, picks up weekly or biweekly. $28/month for onetime pickup; $40 weekly. Firm diverts about 10 tons a month from landfills. Megan Humphrey from Openlands gave presentation on neighborhood tree grants. Openlands is the oldest metropolitan conservation group in the country, focused on Chicago and Illinois. In Chicago, it gives grants for planting trees. Neighborhood associations can apply and Openlands will provide 40 trees to be planted within 2 or 3 blocks of one another. This area is a native oak and hickory forest. Sites need to be in a parkway or a Chicago public school. Applications should be available in the fall for spring planting. Mike LaVitola of Foxtrot introduced his plan for a store in Wicker Park, requiring permission to lift the liquor license moratorium on Division Street. The market currently has two locations: West Loop and Lincoln Park. The premise is a corner store with in-house coffee program, craft beer and wine, and groceries. The moratorium is currently on packaged goods. Foxtrot could not open a liquor store or wine shop, which requires commercial zoning. Packaged goods are considered an accessory. A plan of operation from the Armitage location has been shared with the community. FoxTrot would request a loading zone. Building under consideration would open Nov. 1. Wicker Park Association has voted to support the lift. The Planning, Preservation & Development committee of EVA has recommended to not oppose the lift. The EVA general membership unanimously voted to not opppose the lift and committed to sending a letter of support. Mike Skoulsky presents plans for St. Boniface church rehab. Mike Skoulsky joined the meeting to update members on the progress of adaptive reuse of St. Boniface, 1358 W. Chestnut St. A shared ramp between two buildings provides underground parking for both. Church is 17 units, averaging about 2,000 square feet and 4 units per floor with a 3-bedroom suite. The new construction will be 24 units averaging 1,700-1,800 square feet. Both are elevator units offering at least 1 parking spot per unit. Target break-ground date is spring 2018. Field of Hope ballfield is now under construction at Wells High School, 936 N. Ashland Ave. Project is tearing out parking lot concrete and turning it into a community space. If members are interested, please reach out to Anne Shaw. The committee meeting the 3rd Monday of every month to develop a strategy to employ neighborhood watches and will offer training for volunteers. The committee is also sponsoring a block party planned for Aug. 5, a great time to get involved. More information coming. 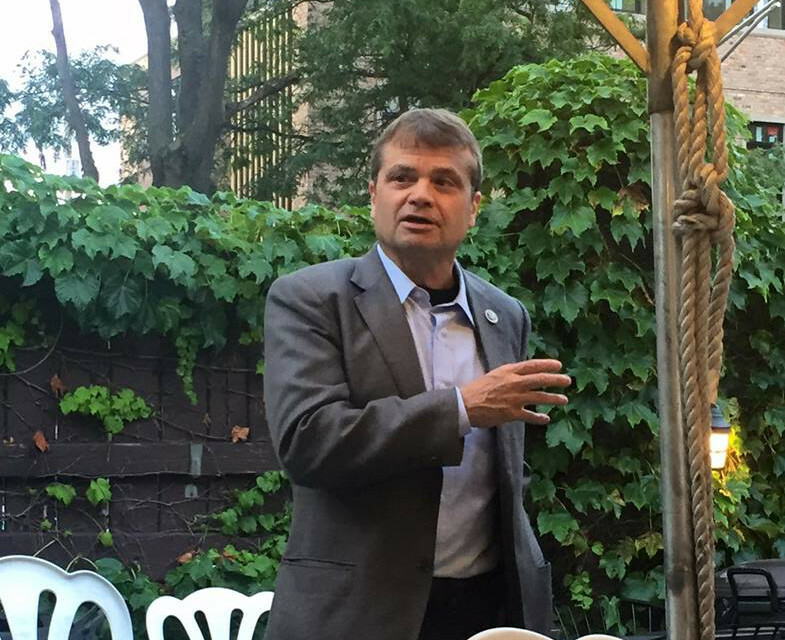 The office of Rep. Mike Quigley is available to help on a variety of issues: help with Medicare benefits, Social Security benefits, passport applications, IRS issues, internships, visiting Washington D.C., federal student aid, military service issues and small business assistance. Congressman’s message: "My goal is to be Chicago's congressman driving resources back to the district. The last month of the Obama administration we brought $100 million back to the CTA. We continue to fight for transparency. [Quigley] formed the Congressional Transparency Caucus. The No. 1 thing we fight for is to keep people safe." Get things done for Chicago. Find out how the Russians did what they did, if there was help and how we prevent this in the future. Moving forward together when the investigation is over.